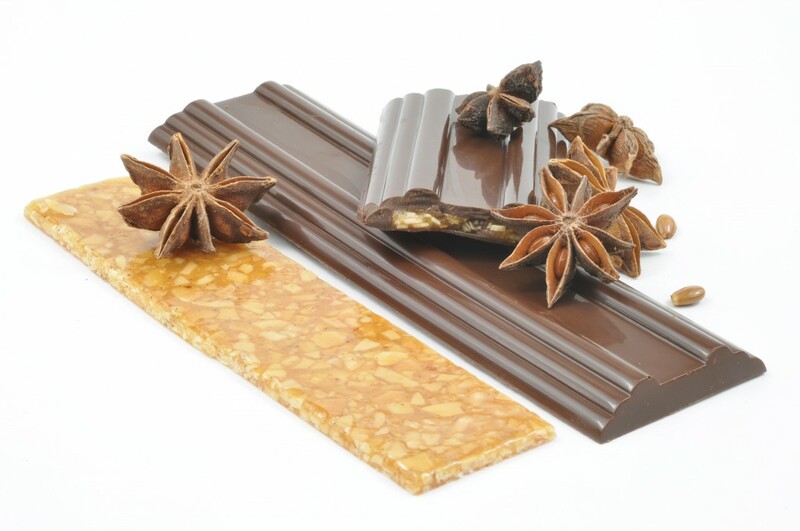 Star anise nougatine enrobed in chocolate certainly belongs to a selection of finer style Belgian chocolates. Too bad that chocolates made with nougatine can be rather difficult to find, unquestionably it is a product which requires attention to detail. Since the confection featured here does not contain a cream, ganache or other typical filling, it is not a true “Praline” or “Belgian style chocolate”. Essentially it is a chocolate bar which contains a sheet of nougatine. 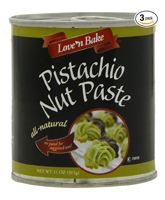 Delicious nevertheless and it has the enormous benefit of having long shelf life. The nougatine recipe below is made without corn syrup or glucose. 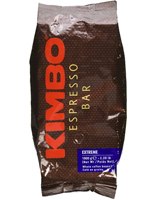 Although more affected by humidity, it does provide an incomparable caramel flavor. 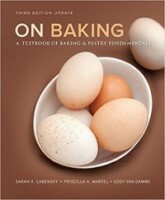 In “On Baking” a recipe for nougatine (pg 734) can be found using only glucose and fondant. Such combination is excellent for use in showpieces or for pieces which require long conservation or when working in a humid environment. When using star anise in nougatine it is important to use invert sugar, without it the nougatine can quickly crystallize when the star anise is added, turning it into a disappointing result. 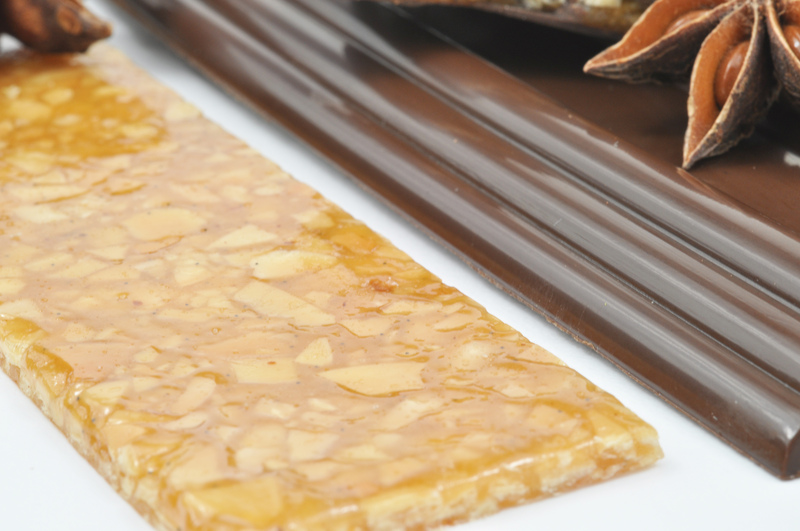 Remember that nougatine requires cooking the sugar to a perfect caramel and adding flawlessly toasted almonds. Dairy or cocoa butter is added at the end. Dairy butter provides the best flavor but cocoa butter works best in high humidity kitchens. For further tips and ideas on nougatine you may want to read another article on nougatine on my site. In a saucepan bring the invert sugar to a boil, add a few tablespoons of the listed sugar and stir to melt the sugar (Do not allow to caramelize at this point). Add a few more tablespoons of sugar and stir until melted again. Continue with slowly adding larger amounts of sugar. Do not vigorously stir at any point. Cook to a golden caramel stirring gently. Remove from heat, immediately add the toasted almonds, star anise, butter and fleur de sel. Stir to combine with a heat resistant or wooden spatula. Scrape the nougatine onto the silpat. Let sit for a few moments and then start gently rolling the nougatine into a thin sheet about the thickness of 3 stacked credit cards. If the nougatine hardens before it is sufficiently thin, keep it on the silpat and place it in the oven to slowly soften. Press with a finger to check if it is soft enough and then roll once more. Cut into shapes which will fit your chocolate molds and allow to cool. Pour tempered chocolate into molds, allow the chocolate to nearly set, place a piece of nougatine in the mold. Cover with chocolate and remove excess. Remove when chocolate has retracted from mold. Eddy – I love star anise, so I’ll give this a go for sure. I’ve only ever infused with star anise before – milk chocolate and star anise ganache is one of my favourites. To grind it, should I just grind the seeds or can the actual “star shell” be ground and used as well? I love star anise as well, much underused. What I do is pop the entire star anise shell in a coffee grinder and grind to fine powder. To get the coffee grinder smelling “neutral” again, grind granulated sugar with baking soda. Absolutely beautiful and sounds most delicious. Something I will make. Thanks for sharing the idea. Nougatine is one of my favorites, can’t wait to make this. Chef Eddy, love your pictures and your recipes! Thanks for all your inspiration chef, it is much appreciated. Nice job Chef Eddy, I like star anise and indeed much underused. Once I made a star anise vanilla ganache filling for bonbons. I cooked the cream with the vanilla and the star anise. Staranise and vanilla is a really nice combination in my opinion. Thank you! Your star anise and vanilla ganache sounds delicious indeed. I may give this a go. Chef, this is absolutely stunning! I’m sure it’s delicious, but honestly I can’t get over how beautiful it is! These are SO beautiful Chef Eddy! They sound amazing and cant wait to try this recipe, and the star anise in it sounds like amazing combination! But where can i find invert sugar ? They sound amazing and cant wait to try this recipe, and the star anise in it sounds like amazing combination! But where can i find invert sugar ? This is definitily a recipe to try. I am from a vietnamese culture and we use the star anise in our noodle soup recipes and this is interesting because the flavor it gives makes the noodle soup and I can only imagine how it would taste with chocolate or in any other recipes out there. This recipe is most certainly very aesthetically pleasing and I loooooove Nougatine as we have something similar to it in Puerto Rico called Turron, but I have to say I am a little intimidated by the star anise. However I can’t say I won’t try it because I really was never a fan of the smell or taste of cloves and I could eat Speculaas ALL DAY LONG!!! So I will try this gorgeous beautiful recipe and see if I can’t become a fan! Chef Eddy you are truly an ARTIST!!! Hiiieee Chef, i loved this recipe its awesome….so generous of you to share it.. 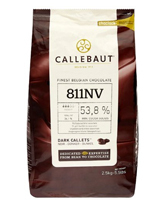 The sweetness of the nougatine is complimented with the licorice flavor of the star annise and the fine chocalte taste. I can’t wait to make this. I would love to try this recipe the chocolate, almonds, and star anise flavored nougatine all sonud like a good combanation. Teaspoon and tablespoon measurements can be very confusing. The weight of a a filled teaspoon depends on the content. If filled with water, one teaspoon will weigh 5 gram, sugar the same. Spices are much lighter and one teaspoon of most spices will only weigh 2 gram. Take a look Sean and let me know if you end up with same findings. This is absolutely beautiful. I really wish I could create something like this. We created nougatine in class, but it was nothing like this! It does have a wonderful flavor, but your presentation makes me want to divulge in it. I’ve never use fleur de sel or star anise.. could you mention what those are? love the mold. Would to see how it tast. nougatine is so easy to make and so good. this recipe and the presentation of it makes me want to whip it up now! The attention to detail is astounding but of course it is, since it’s your work chef.